Green Lipped Mussel Powder is internationally recognized for its powerful inflammation management properties. Sourced from New Zealand’s Marlborough Sounds, our high strength, 100% pure powder offers a higher concentration than other Green Lipped Mussel supplements. Packed with nutrients, vitamins, minerals and Omega-3’s, this natural superfood promotes healthy joint and cartilage function to help keep you moving, with ease. Pure Green Lipped Mussel Powder is a 100% natural supplement, sourced from the remote and unpolluted waters of the New Zealand’s Marlborough Sounds. Arguably one of nature’s most complete whole foods, Green Lipped Mussels contain an abundance of vitamins, minerals, proteins and Omega 3 fatty acids, all of which combine to have a beneficial effect on connective tissue, cartilage and joint health. Xtend-life Green Lipped Mussel Powder is derived from mussels harvested under strict conditions to ensure sustainability, safety and traceability. These mussels are then opened in cold water using a proprietary technique to optimally preserve the product’s beneficial properties. The ability to move with ease is something we take for granted when we have it – and suffer immensely when it’s gone. When life’s simple pleasures, like going to the gym, biking, walking or performing daily tasks results in painful, aching joints we naturally start to curtail our activities. Furthermore, if inflammation becomes chronic it can lead to a whole host of health problems and seriously affect our overall wellbeing. The proven, powerful and all-natural Xtend-Life Green Lipped Mussel Powder works to support your joint health, reduce everyday aches and pains, and help to keep you mobile as you age. How does Green Lipped Mussel Powder work? Glycosaminoglycans, also referred to GAGs or the “glue of life”, play a vital role in the health of cartilage, tendons, skin and connective tissue. As we age, we lose precious GAGs and our cartilage becomes drier, thinner and more brittle. The GAGs found in Green Lipped Mussel Powder help us to regain the elasticity within our connective tissue and maintain supple, healthy joints. Omega-3 Fatty Acids provide a range of natural benefits, one of which is to replenish the moisture in our cartilage. This in turn supports inflammation management, eases discomfort and promotes joint mobility. This product is 100% green-lipped mussel powder. There are no fillers present. Xtend-Life’s Green Lipped Mussel Powder is a natural product from selected mussels cultured in the pristine waters of the Marlborough Sounds, in New Zealand. To ensure optimal benefits, these unique mussels are processed at low temperatures while fresh to ensure that all of the valuable fractions of the mussels are preserved. The Green Lipped Mussel (Perna canaliculus) is a species found nowhere else in the world. An environmental focus and strict regulations enable us to deliver a product of exceptional quality. Green Lipped Mussels are an exceptional whole-food, packed with valuable nutrients. Other ingredients: Capsule (Hydroxypropylmethyl Cellulose, Water), Rosemary Leaf Extract. Does not contain soy, dairy, gluten or peanut. Note: Contains shellfish extract. Anyone with a shellfish sensitivity or allergy should avoid this product. Take anytime, with or after food. As this product is a 'food' you can double your dosage to 8 capsules per day, for as long as you wish. Combines well with Not Just Joints, Omega 3 Fish Oil products and Total Balance. 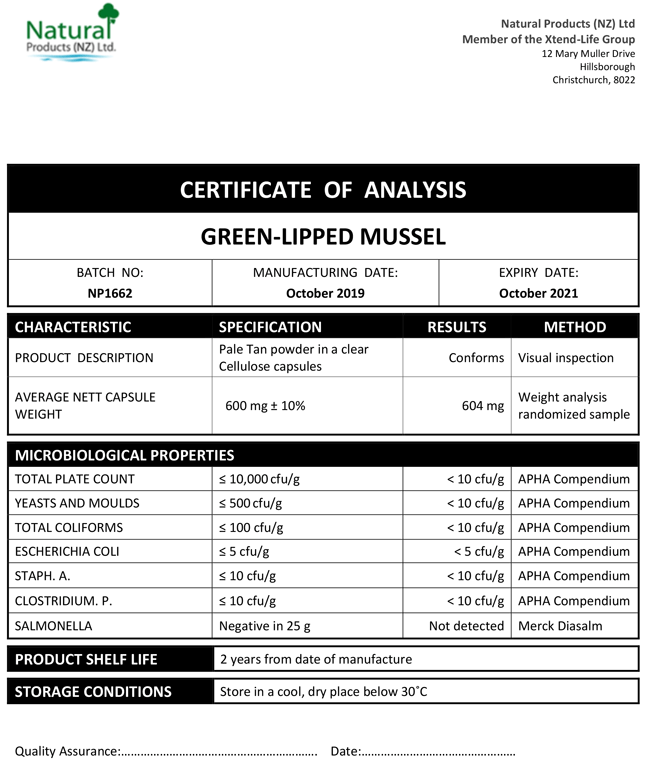 We have included below a copy of a typical Certificate of Analysis (CoA) for our Green Lipped Mussel Powder product. You will note that there are two columns which are headed 'Specification' and 'Results' respectively. The specifications are simply our minimum standard to which each batch of Xtend-Life Green Lipped Mussel Powder has to conform, otherwise we would not release it. The results are the actual results from the independent laboratory that did the testing. What are the levels of EPA and DHA in Green Lipped Mussel Powder? EPA and DHA are both Omega-3 fatty acids. While we have not had our Green Lipped Mussel Powder tested specifically for levels of EPA and DHA, Omega-3 fatty acids generally make up around 1-2% of the total Green Lipped Mussel Powder. Can I take Green Lipped Mussel Powder if I’m allergic to shellfish? Our Green Lipped Mussel Powder is NOT suitable for anyone who is allergic to shellfish as it contains organic components directly derived from green-lipped mussels, which are shellfish. Is it safe to take Green Lipped Mussel Powder with a NSAID (Non-Steroidal Anti-Inflammatory Drug) prescribed by my doctor? Our Green Lipped Mussel Powder is an all-natural product and should be safe to take with most medications. However, as with all medications you should discuss taking this supplement with your doctor. We recommend leaving a 3-4 hour gap between taking any medications and taking your supplements. Is Green Lipped Mussel Powder free from heavy metals? We stringently test the levels of heavy metals in every batch of finished Green Lipped Mussel Powder. Generally, the accepted international limits in a finished product are less than 3ppm (parts per million) for both Mercury and Cadmium. You can be assured that our results are all well under these limits. Please see our Certificate of Analysis for more information. Is it normal for Green Lipped Mussel Powder to have a strong smell? Green Lipped Mussel Powder has a natural ocean aroma. If you are not familiar with the smell of mussels in their natural state, it may take a little bit of getting used to, but please rest assured this means that the product is very fresh and potent, and rich in bio-active nutrients.